If the USDA beef grade shields and the difference between "Prime" and "Choice" are a mystery to you; we can help with some simple explanations and photos. Prime graded beef is an abundantly marbled to moderately abdundantly marbled (the amount of fat interspersed with lean meat) beef, produced from young, well-fed beef cattle. The marbling makes the beef very tender and juicy. It is usually sold to restaurants and hotels, but Costco and some grocery stores also carry it.. While it is more expensive than other grades, Prime beef roasts and steaks are excellent for dry-heat cooking such as broiling, roasting or grilling. Choice graded beef is also high quality, but has less marbling than Prime beef; typically "moderate" marbling. Choice neef roasts and steaks from the loin and rib will also be very tender, juicy, and flavorful. These are sold at most grocery stores. These cuts can also be cooked with dry heat , braised, roasted or even simmered. Select graded beef is less marbled and leaner than Choice or Prime grades, more like "slight" marbling. , but does not have the juiciness and flavor. It is best to marinate them before cooking; or alternatively braising to improve tenderness and flavor. Flank steaks and London broils are typical of this. Below these grades are also Standard and Commercial grades of beef. These are usually sold as ungraded (meaning there is no grade shield on them) or as store brand meat. Utility, Cutter, and Canner grades of beef are even lower, but are seldom seen by the public, as they are used to make ground beef and processed products. So which grade should I buy? Keep in mind that the grading scale is a spectrum and it is subjective. 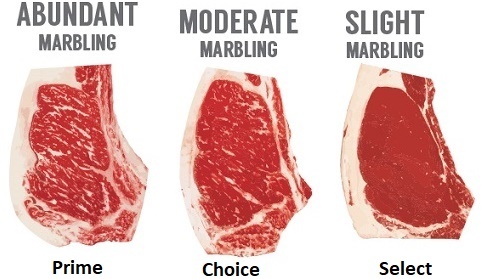 So you can find some cuts of steaks labeled as "Choice" that have as much marbling as some "Prime" cuts. In other words, if you look through the steaks in the store, you will find some Choice steaks that are as good as the Prime steaks. Marbling: more dispersed marbling and fine texture. Darker color? That generally means it came from older-age cattle and also has a more coarse texture. Just like beef, there are five grades for Veal: prime, choice, good, standard, and utility.The standards are the same, except that due to the young age of the animals, the veal will look a light grayish-pink to light pink, rather than a bright red. It should be fairly firm, and velvety in texture. Chops can be cooked by roasting, grilling or broiling. Click here if you would like to see a 22 minute long educational video about the beef grading process . The video covers the entire process from farm to table and dwells on the grading process..